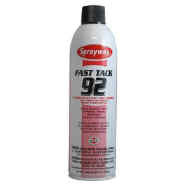 A contact adhesive, this product is designed for bonding vinyl tops, heavyweight headliners, and hood silencer pads where high strength and heat resistance are needed. It features high, immediate bond strength with a non-misting, lace-like spray. 13 oz aerosol. 12/Case.